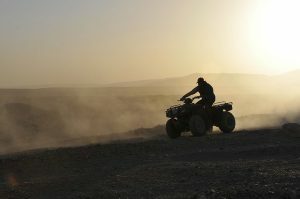 Following the death of a 58-year-old man on a Quad bike, the ACTU is calling for roll over protection devices to be made mandatory on all new Quad Bikes that are produced. ACTU assistant secretary, Michael Borowick pointed out that there have been 160 Quad bike deaths since 2001. He also stated that quad bikes are unstable and due to their increasing popularity as farm work vehicles fatalities could increase, resulting in more injuries and death. Providing roll bars on Quad Bikes makes good sense. Mr. Borowick pointed out how tractor fatalities have decreased by 80% since it became mandatory to have roll over protection on these vehicles in 1992. It is the belief that installing rollover protection for Quad Bikes could result in the same type of statistics thus saving life and serious injury to those who use Quad bikes on farm (and even for leisure). As most people know Quad bikes also known as four wheelers in other parts of the world offer no protection for those using the vehicle in case of an accident where the Quad rolls over. Providing roll bars or some other type of roll over protection device could prevent riders from being trapped under the vehicle should it roll over, which increases the chances of surviving an accident with this type of vehicle.